Traffic is backed up for kilometres. Photo: Supplied. Protest action near the Tongaat toll plaza has created a backlog of cars, forming queues stretching 3km. 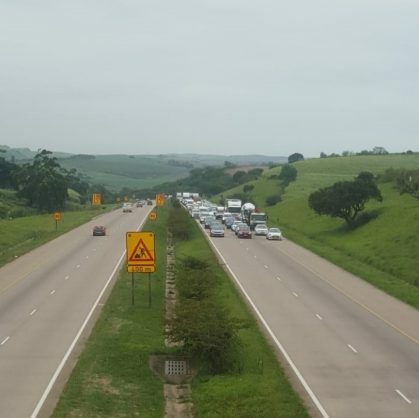 Hundreds of motorists have been left stranded on the N2 southbound for hours since this morning after being caught in the middle of a fuel strike, reports North Coast Courier. The vehicle go-slow resulted in a massive traffic backlog between Stanger and Tongaat and is currently near the Tongaat toll plaza. The plaza has since been closed. A queue of cars at least 3km long is forming while motorists wait to go through the toll plaza. Police have reportedly contained the original protest near Mariannhill toll plaza, led by trade union Cosatu’s KZN branch, which seriously affected the flow of traffic on the N3. A few North Coast residents dressed in red decided to join in the action, leaving local motorists fuming. One motorist, who was caught just as the strike action began, says he was stuck behind the “leaders” of the strike. “I was driving through the Stanger Manor robots and they jammed my car. They said I could not go any further forward or they would chase me,” said a driver who asked to remain anonymous. “I followed them out onto the N2 where they were driving into oncoming traffic, zig-zagging their cars and spinning tyres. Many of the people involved were allegedly drinking and throwing their empty bottles around. The motorist, who was ironically sitting with an empty fuel tank, eventually managed to escape the roughly 4km long traffic jam by taking the Groutville off-ramp, over the bridge and back down onto the N2 in front of them. It is unclear whether the people leading the strike on the North Coast are members of Cosatu, as unions affiliated to Cosatu were also participating in the protests. Motorists are urged to use alternative routes.